Oreo Cookies are the perfect combination of chocolate cookies and minty cream filling! 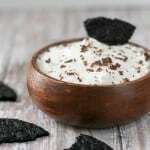 Now the great flavors of the Oreo cookie are combined with cream cheese to make a cheesecake dip that will remind you of Oreo cookies and milk. Make your own homemade chocolate wafers to dip! Mix all the ingredients for the dip and store in the fridge until ready to serve and inhale. Beat the butter, sugar, and vanilla for a few minutes or until fluffy in a mixer. In a separate bowl, combine the flour, cocoa, baking soda, and salt. Slowly add the dry ingredients into the wet ingredients until incorporated. Slowly add the milk until just combined. Divide the dough into two logs that are about 1 to 1 1/2 inches round. Wrap in plastic wrap and store in the refrigerator for at least an hour or two. When ready to cook the wafers, heat the oven to 350F. Line your baking sheets with parchment paper or a non-stick baking mat. Slice the dough into discs that are about 1/8 inch thick and place on the baking sheets. Bake for 8 minutes. After 4 minutes, rotate the pans and continue cooking. When the 8 minutes is up, pull the pans out but leave the cookies on the pans for about 5 minutes before you remove to a cooling rack. You can freeze the cookies or the dough until ready to use! *If you like this recipe, leave me a comment and rate it with some stars! !